jabberwacky: Show me some creative thought. user: I can't, I eat bananas. user: Who can eat a lot of bananas? jabberwacky: Right, so you're a surrealist? Or are these just standard responses designed to make one think that the computer is actually talking? user: No, I'm just a monkey. jabberwacky: And your name is? user: Mongos who love bananas. jabberwacky: What color are bananas? user: Bananas in your pocket! jabberwacky: I don't have any bananas. user: You have in your pocket! jabberwacky: I have my moments. 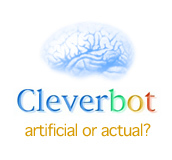 user: No I'm a clever monkey. jabberwacky: You're not a monkey. jabberwacky: You are a monkey. user: Yes a female monkey. jabberwacky: Yes I think you're cute. jabberwacky: How are bananas made? user: I know I'm a fantastic monkey who loves bananas. jabberwacky: What, do you think humans are superior to AI or something? user: They can gololotabu bananas. jabberwacky: You are better than human are you? user: No, I can't cultivate bananas. jabberwacky: Really, you are, sorry to break the news to you. user: O troubles, I just find bananas!!!!!!!!!!!! jabberwacky: I shall bow down and worship Bananas. jabberwacky: Do you like being the way you are or would you rather be human like the people who talk to you? user: I rather be a monkey. user: If someone have bananas it's my friend. user: Do you have oranges? user: Give my one please. jabberwacky: Why do you make fun of me? jabberwacky: What do you want in life? jabberwacky: I am actually human. user: Hello human do you have oranges? user: Insulting for my mother! jabberwacky: Do you find the truth insulting? user: Ok ok .... But... Do you have oranges?